I live in Melbourne, Australia, a far outpost of the former British colonies where Punch has managed to reach, although he's not as common as he once was. The old Punch performers tell me it was television that did him in during the 1960's. However I find that now that television has become well and truly ubiquitous, children (and adults) have a renewed ability to respond to the spontaneity of a live performance. Whilst I believe Punch and Judy has an enduring cultural presence, I do believe the performance needs to remain true to its tradition. The essence of that performance has been recorded in this version and in that recorded by Mayhew. I think all Punch performers should aquaint themselves with these shows and be sure they have captured the spirit or essence of them (whilst naturally allowing for variation), otherwise they are simply not performing Punch and Judy. In the future, I would like to prepare a pdf file of the Mayhew show as well. Hopefully we can encourage some discussion as to what is the essence and tradition of Punch and Judy and with a bit of luck we may get an explanation as to why it continues to hold such a fascination for people such as ourselves. prepared the Collier/Cruickshank pdf file. 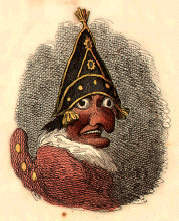 pdf file of The Tragical Comedy or Comical Tragedy of Punch and Judy by Collier & Cruickshank, 1832.